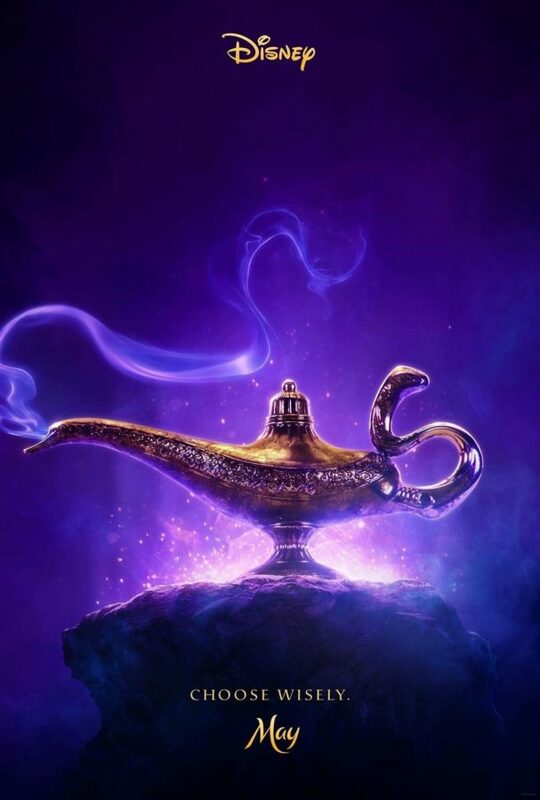 The poster for Aladdin featuring the famous genie lamp. Everyone loves going to see a new movie and enjoying the atmosphere of the comfy seats and the buttery popcorn. It is even better to see a movie when you have been waiting for it for what seems like forever. The upcoming movies of 2019 are sure to draw crowds and satisfy people for a long time. Toy Story 4: This movie is one people are anxiously waiting for. The Toy Story franchise is one that has been a part of children’s lives for years. Everyone loves, or at least has seen, Toy Story. It was a huge part of most of our childhoods. After Toy Story 3, fans of the franchise did not think that there would be another installment. Even though the ending to the third movie seemed like it wrapped everything up, a fourth movie was announced. This movie will have the same beloved characters of Woody and Buzz but will feature a new character named Forky. One thing is for sure: Pixar never seems to disappoint. This movie will hit the screens on June 21st. The Lion King: This beloved animated film is getting a reboot. With newer and more sophisticated animation technology, this film is sure to bring a whole new life to the original movie. The story of Simba will be told in a new light. While met with some hesitation at first, fans eventually warmed up to the idea of rebooting the amazing story. This movie is scheduled to be released on July 19th, the 25th anniversary of the original movie’s release. Plus, Beyoncé is voicing Nala, so she has practically blessed this movie already. Aladdin: Disney is really pumping out the movies this year. A live-action reboot of the famous tale of a street-rat turned prince is being released on May 24th. Familiar faces, such as Will Smith, will be on the big screen in this remake. Aladdin is a Disney classic and audiences have been obsessed with this story for years. The costuming and special effects are sure to wow fans all across the globe. Even though people always say that they are sick of Disney movies, it will not stop them from coming to see this one. Spider-Man: Far From Home: It is amazing that even though this is the 23rd film in the Marvel cinematic universe, people still lose their minds over new releases. Even though there have been previous Spider-Man franchises, this one is set apart from the others because of the fresh ideas and storyline it provides. The setting is in high school, so the comedy seems more fresh and the characters are more relatable. It has a sense of lightness that most of the other Marvel movies don’t have. Set to be released on July 5th, this movie will bring in tons of people to watch. Plus, the previous movie in the franchise was more lighthearted than a lot of other Marvel movies. And audiences need a bit of lightheartedness after the Thanos snap in Avengers: Infinity War. Avengers: End Game: Another Marvel movie to be released this year is Avengers: End Game. This is highly anticipated due to the rather shocking ending of the previous film. It would seem like all these Marvel releases would make audiences grow bored of the universe, but that has yet to happen. People still flock to the theaters in masses when a new movie is released. This will be the case with this movie as well. This will pick up where the last movie left off. Set to be released on April 26th, the country will probably be in a frenzy due to this movie.